When I was little, my Mom made waffles for lunch or dinner more often than for breakfast. It makes sense to me, why not make them at night during the week when you have time to enjoy them, or for lunch on a weekend if you have things going on in the morning? So now I tend to make my waffles after work or in the evening as opposed to morning. Don't get me wrong, I love the idea of brunch and elaborate breakfasts, but my mornings are usually busy with working out and getting ready to go somewhere so I don't have time for a sit down meal. Waffles have always kind of seemed like a special thing to me also because it's not something I make all the time and I always feel like I am enjoying dessert (which was awesome when I was little). So earlier this week, I decided that waffles sounded good. I have only used the Belgian waffle maker I got for Christmas once so far so it was about time! 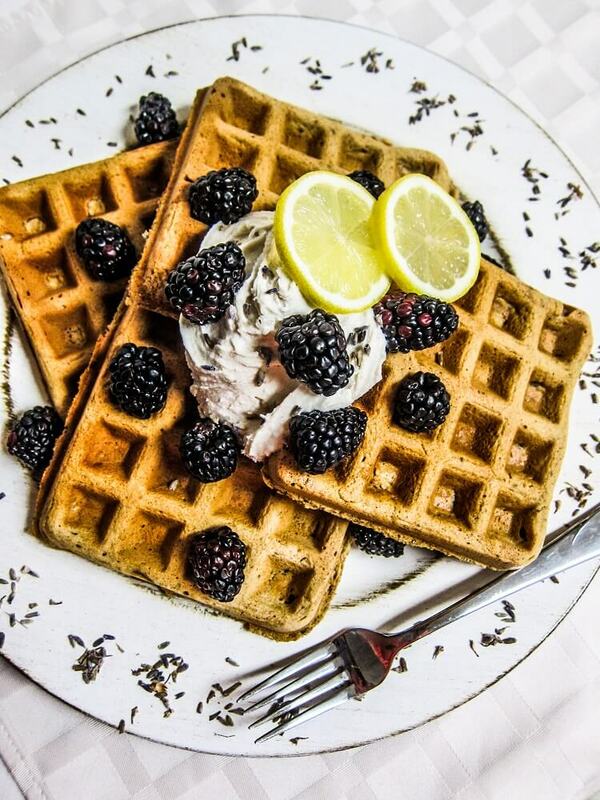 I have been loving citrus lately, so I decided on lavender lemon waffles. I love the flavor combination, and I figured the aromatic lavender was perfect for de-stressing after work. I used my classic waffle recipe, simplified slightly because I didn't have one of the ingredients on hand, with the addition of both lemon zest and lemon juice. I wanted to be able to taste it and smell it in the waffles. Just a little lavender and vanilla as the additional flavors, and these were heavenly! My waffle maker makes 4 waffles at a time, so these were done in no time at all, and my kitchen smelled amazing! Although they tasted good just as they were, I wanted to make them a little more fancy so I whipped up some lemon cream to top them off with. They were heavenly! Crispy waffles with soft centers, the bright flavor of lemon and fragrant aroma of lavender in every bite, plus that rich lemon cream...OMG they tasted like dessert. And yes, they kind of are, but who doesn't want dessert for their meal sometimes?! 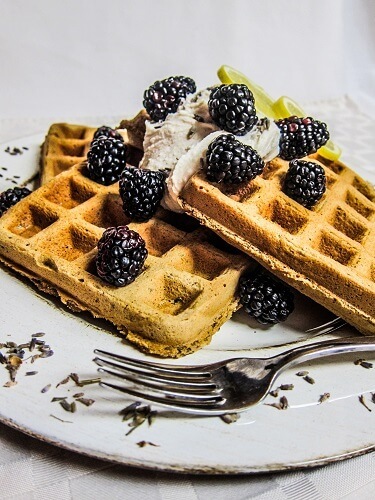 To make the cream for in between the waffles, combine all ingredients in a high speed blender or food processor until smooth. Pour into a bowl, place in the freezer, and whisk every 15 minutes until it is thick like whipped cream (it will probably take about 45 minutes). Once it is thick enough move it to the refrigerator until you are ready to eat the waffles. 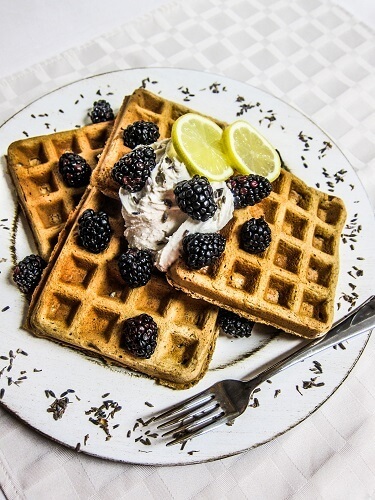 To make the waffles, whisk together the flour, sugar, baking soda, baking powder, sea salt and lavender in a large bowl. Then whisk the lemon juice and zest, flax mixture, oil, and coconut milk together until smooth. Heat your oven to 150F degrees and oil, and pre-heat waffle iron. Once it is heated, pour about 1/3 cup batter onto the waffle iron or until the iron is just covered (but not so much that it will ooze out) and close it. Cook according to waffle iron package directions. Remove from the waffle maker and keep warm in the oven while you make the others. If you have a waffle maker the size of mine (regular belgian waffles), you may have more than 8 waffles. 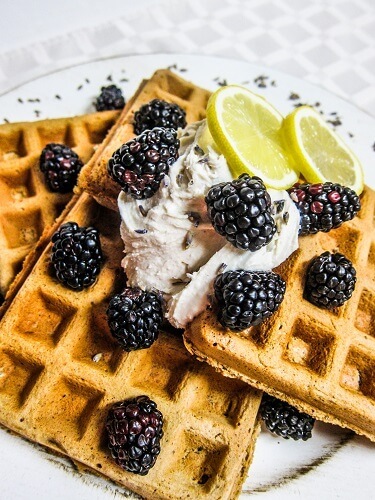 Serve the waffles with the lemon cream! 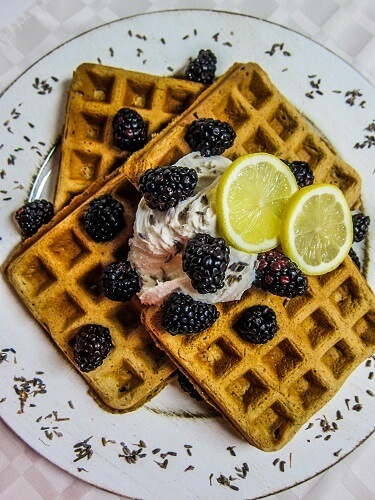 *If you do not wish to make a gluten free waffles, whole wheat pastry flour will work as well!